We have choirs for all ages starting with Little Starz, an introduction to group singing for children aged 4 – 6. Our Little Starz will discover their voices using rhymes and traditional songs, while also exploring part-singing and movements. 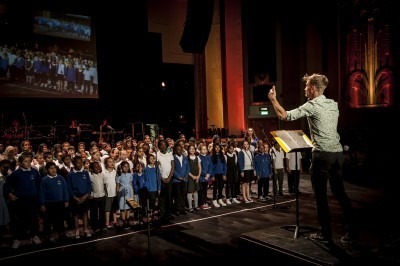 Next up is Newham All Stars for ages 7 – 11, our friendly and welcoming choir for students who enjoy singing different styles of music. The All Stars often work on original songs as well as popular favourites. If you’re in years 5 – 8, ask your music coordinator at school about Extraordinary Voices. You need to be recommended by your school and to pass an audition (don’t let this scare you!). XV often have opportunities to perform at local events and with other musicians. The Big Sing is our new massed singing group in which every Academy member is invited to participate. We will host Big Sing sessions intermittently each term, learning fun new songs for all ages. Our Sing East Community Choir is a fun and social choir for Newham residents. This adult ensemble sings a mixture of pop, gospel, music theatre, classical and jazz, and they get many requests to perform at restaurants and events around the borough (ages 18+).